In printers or copiers teflon (heating) roller plays a decisive role in the quality of printed images. And while some users may not know what is teflon roller and what are its functions, they notice when it is not operable. The main function of teflon roller is continuous fusing process, fixing of toner on paper or fabric. The task seems simple, but it requires qualitative performance, with accurately applied balance, set temperature and for a definite period of time. With the right combination of these factors image is impossible to print without defect. However, a small error in one of two variables can result in blurred images, streaks, double prints or can cause paper jam. In many cases, the cause of the defects is faulty heating roller and it often appears the last checked during the diagnosis of the device unit. There are three main reasons of heating roller crashes. 1. Excessive heating: in this case, overheating of the shaft while fusing the toner causes smearing of image near the edges. Such problem can lead to contamination of roller and cleaning system, thus adjacent parts of the system can go out of order. 2. Insufficient heating: in this case, insufficient heating of the roller while fusing results in bad quality of prints, cause the toner is not fused well. Such problem can also lead to contamination of roller and cleaning system, thus adjacent parts of the system can go out of order. 3. Damage during rotation: contact with internal components (separator, paper, thermostat, etc.) can result in quick wear and damage of the roller surface, as well as to such prints defects as toner or oil strips. High quality teflon shaft must have accurate temperature control, superior characteristics of toner detachment, smooth rounded surface, resistant coating, sufficient walls thickness, etc. Thus, the consumers should get rid of the frequent misconception “more coating is better” or that twice thicker coating is able to provide twice longer service life of the unit. In many cases temperature range suitable for fusing is quite narrow, the maximum thickness of the coating can vary not exceeding one or two microns. 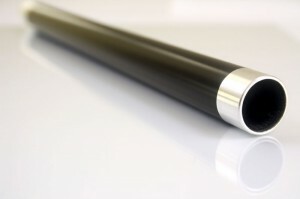 If the coating is too thick, the shaft cannot conduct enough heat, otherwise it overheats too quickly. Of course, teflon rollers are not subject to daily care, however, they are worthy of investment. You can save money purchasing low quality rollers, but at a result such a decision inadvertently leads to even higher expenses for services and maintenance.